Within the “Plan Andaluz de Sostenibilidad Energética“ (Andalusia Sustainable Energy Plan) there have been made ​​the revamping of the lighting infrastructures of two public buildings: A primary care health center and a high school (secondary level educational center). These projects seek, through the use LED technology, carry out two pilots where it is possible to get, for this type of building, a facility not only energy efficient but also comfortable for their users and with low maintenance requirements. Thus, they must comply with all the current regulations in force, both in general and for their specific functionality. Assessment of the statusand efficiencyof the facilitiespriorto their remodeling process. Acomprehensive analysisof thestatusand efficiencyof the new LED lighting installationafter the revamping. A reviewof the facilities after one yearof use. In this paper we collect the most important results acquired on each of these three stages, comparing the current new situation with the previous one and we also analyze the most relevant technical and economic aspects related to these remodeling processes. 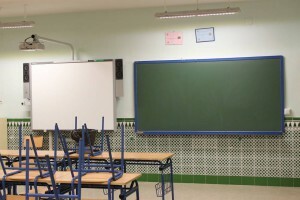 The Ministry of Economy, Innovation and Science, through the Energy Agency of Andalusia, along with the Departments of Education and Health of the Government of Andalusia have driven two pilot experiences involving the introduction of LED lighting technology in Andalusia´s schools as healthcare centers. The project falls within the framework of the “Plan Andaluz de Sostenibilidad Energética (PASENER) 2007-2013” (Andalusia Sustainable Energy Plan 2007-2013) (AAE, 2007) and the agreements signed with the “Instituto para la Diversificación y el Ahorro de Energía (IDAE)” (Institute for Diversification and Saving of Energy) for development in Andalusia of the Action Plan (IDEA, 2007) with the Strategy of Energy Saving and Efficiency and the Renewable Energy Plan. Their main objectives are to analyze the state of the facilities of these pilot centers after several years of usage with conventional lighting technologies and assess the potential of renewing them with new generation LED products for energy savings and the adequate accomplishment with the new lighting regulation that can justify its extension to other public buildings and facilities in Andalusia. To remodel the lamps of a fluorescent-based installations toward a new ones uniform and energy-efficient with LED technology. To improve the lighting parameters measured in all the areas to meet the levels required for these types of buildings. 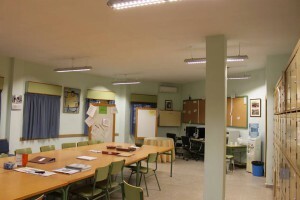 This process of renewing the lighting systems must adapt both buildings to the requirements of the current legislation described on the basic document HE3 developed in the CTE (‘Código Técnico de Edificación’ or Technical code for buildings), the European standard for indoor lighting (EN 12464.1), and the specific provisions of the functionality of the two specific facilities under study: ‘Norma de Diseño Constructivo para los Edificios de Uso Docente‘ (constructive design rule for educational buildings) of the Ministry of Education of the Government of Andalusia (BOJA, 2003) and ‘Guía de Diseño de Centros de Atención Primaria’ (design guide for primary care health buildings) of the Health Service of Andalusia (SAS, 2008). The promoters of these remodeling projects, having in mind that the previous installations did no fulfilled all the normative requirements fixed as the initial demand for the revamping proposal to obtain only a 10% of energy saving compared to the estimated previous consumption in terms of the nominal parameters of the technical specifications of the equipment prior to their installation. However, the new lighting installation should meet the parameters of light intensity and uniformity and visual comfort described in the referred regulations. 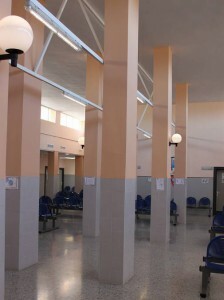 To make it possible that these projects can be accomplished fast enough and by local processes or steps, so that the activity of the buildings are not stopped or affected, no electrical modifications were planned and so the number of lighting points was to be kept exactly the same in the old and new lighting systems. 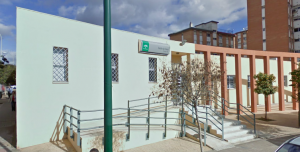 The pilots were carried out in the ‘Centro de Enseñanza Secundaria (CES) Portada Alta’ (Portada Alta High School Center) and ‘Centro de Salud (CS) Portada Alta’ (Portada Alta Primary Cares Health Center) both placed in the same district of the capital of the province of Malaga. In this paper we present the main comparative data, results and conclusions obtained in the different steps of analysis: the previous installations, the new one generated with LED technology at the time of its installation and this same one a year later. The building selected to be analyzed on the specific area of health care center was the C.S. Portada Alta. It is located at José Bergamin Square, N/N, Malaga, Malaga, Spain. ZIP: 29007. The table 1 shows the values required by the normative to be found on this type of public service. Figure 1: Outdoors of the C.S. Portada Alta. Table 1. 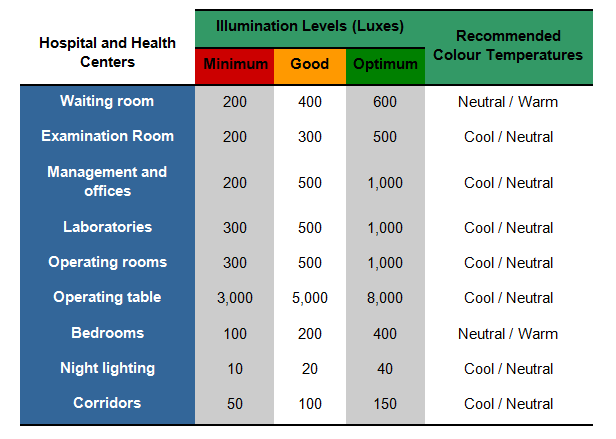 Illumination levels and color temperature requirements for health centers. 248 units: LED tubes of 60 cm. length. 172 units: LED tubes 120 cm. length. 12 units: 60 W incandescent bulbs. 4 units: 250vW mercury vapor lamp. A complete process of measurements was carried out to analyze the performance of: the real power consumption and the light intensity in all the different areas of the health center before the change. The 248 units of the 60 cm. fluorescent tubes of 60 cm. ​​have values between 25 W and 38 W, depending on the brand of the tube and the type and age of each of their electromagnetic ballasts. The average consumption results of 30 W per tube. The 172 units of the 120 cm fluorescent tubes have values ​​between 44 W and 67 W, depending on the type or brand of old tube and electromagnetic ballast and tube luminaires were installed. The average consumption results of 55 W per tube. 12 units of 60 W incandescent bulbs: 730W. 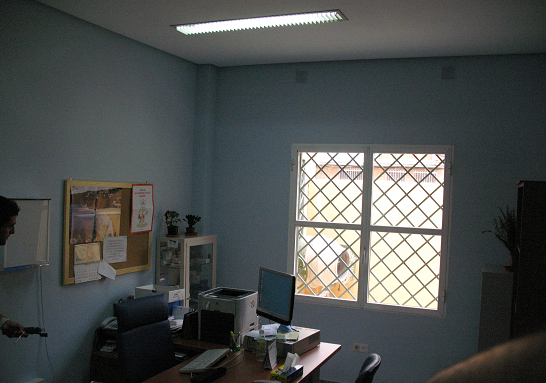 14 units of 2 x 26W Down-light: 910W. 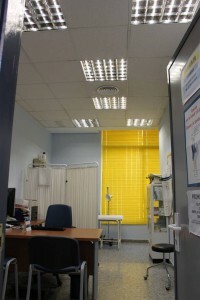 4 units of 250W mercury vapor bulbs: 1160 W.
This health center works mainly in daylight hours and has good windows and open skylights surfaces. Thus, in the main hall, if the blind are used correctly the right levels indicated by the legislation can be easily achieved, at least in daylight hours. However, in many other spaces were not measured the light levels required by the current standards for these kind of centers. This was found especially severe in the medical consultation and also in the administration and management units where the average levels measured were below 200 lux. Figure 2: Examples of the conventional lighting system analyzed before its renovation. C.S. Portada Alta. 248 units of LED tubes of 60 cm. with 12 CREE MX-6® LEDs, replacing fluorescent in consultations, administrative and management facilities, medical staff toilets, and cleaner´s rooms. 172 units of LED tubes of 120 cm. and 24 CREE MX-6® LEDs, replacing tubes in most of the consultations and in some units in and out. 12 units of 6W LED bulbs in various wall sconces. 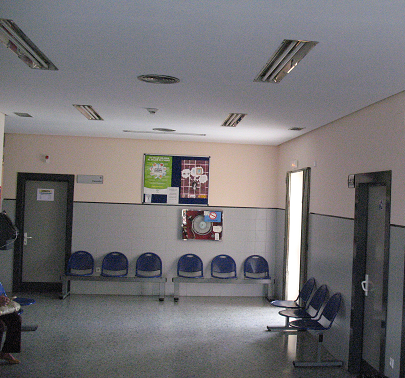 14 units of 24 W Down-lights in the hallways and in the main waiting room. 12 units of 6W LED G10 bulb for ceiling hoses. 10 LED luminaires with 1 tube of 120cm and 24 CREE MX-6® to remove the mercury vapor lamps. Figure 3: Examples of the LED system obtained in the C.S. Portada Alta. In each of the 248 LED tubes of 60 cm. the measurements taken are between 8 and 10 W, depending on the strength of the power supply. The average consumption of the 248 tubes becomes of about 9 W per tube. In each of the 172 LED tubes 120 cm. the measurements carried out are between 18 W and 22 W, depending on the strength of the power supply. The average consumption of the 272 tubes becomes of about 20 W per tube. The power of the 12 LED bulbs for wall sconces was 84 W.
The 14 Down light LED lamps were 180 W.
The energy saving was significant: These values range between a 60% and a 90% depending on the type of lamp compared. Overall, the average savings of the complete installation is a 63%. With the installation of LED lamps there have been improved the luminance measurements obtained in all the different units between a 40% and a 80%. These two measures were made without input of solar lighting to avoid any differences causes by clouds or the time of the day. 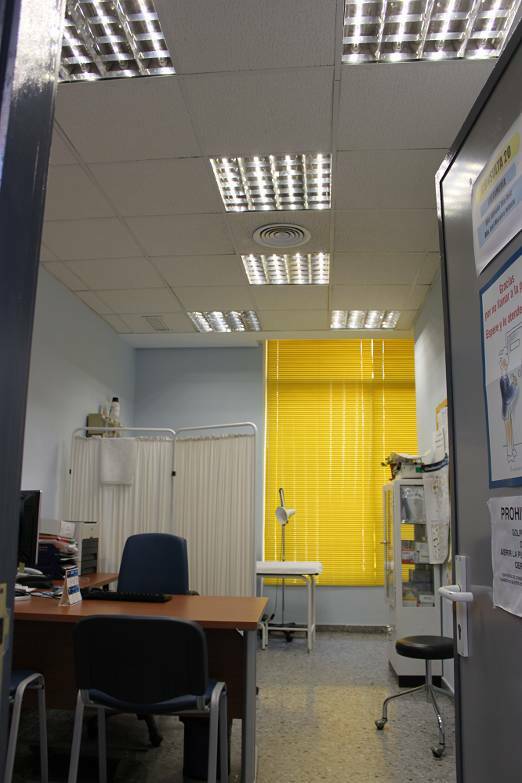 Without sunlight, both the old and the new lighting installation have not gotten the light levels indicated in the standard for the medical consultations and for some specific units. This has been impossible to solve as no change in the existing luminaries in the center were programmed or allowed. To reach the uniformity legislation levels would require increasing the number of luminaires or replacing the existing ones with more efficient models. Even though, the new one has come out in a very close approach to these levels. The new installation has almost double the levels that were giving the fluorescent tubes. With these values we have got closed to the achievement of the uniformity and brightness levels required to approach the current rules. The power consumption of the lighting installation has been reduced by a 63%. 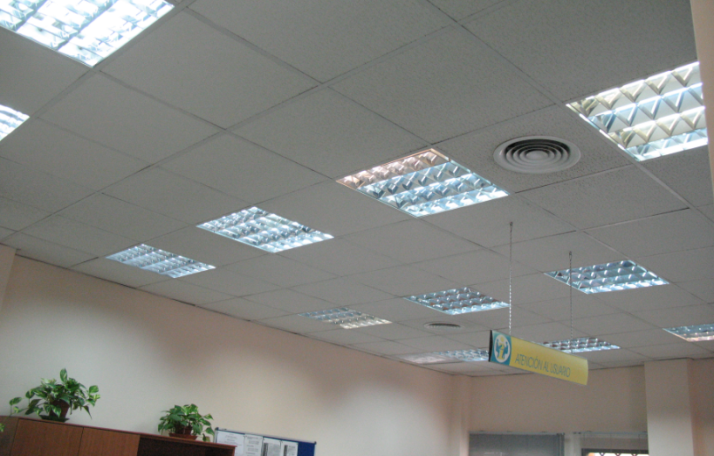 With an estimate average daily use of 10-hour lighting for 285 days per year (in this case the estimated use of lighting is complex because -although there are lights that have a daily average use less than 1 hour- there are a large majority of luminaires that have a higher average daily use with 11 hours). The average energy savings achieved throughout the center is 12,241 W. This means an annual cost savings of: 12,241 W x 10 hours x 285 days = 34,886.850 KWh. With an estimated cost of 0.16 euros per kWh the cost savings by installing energy saving per year is 5,582 €. If we add around 3,420 € per year savings in maintenance costs, annual savings have 9,000 €, being much closer to the fulfillment of the rules, without adding any new point of light against the clear breach of the above situation. Figure 4: Visual comparison of the LED (a) and the fluorescent (b) lighting system on the C.S. Portada Alta. In this period of usage there has not been reported any malfunction of any LED lamp installed. This means that the maintenance cost of the lighting installation for this first year can be consider null. All the lighting points are working properly and with the expected values of illumination measured. The measures of the power consumption after one year of use in the same rooms have shown minimum variations, so the installation can be consider very stable at this point. The average reduction of the illumination measured after this period of time compared with the ones obtained initially are found to be in the range of the 0% and the 4%. In this sense all the values taken are still over the normative requirements. If we consider a minimum measure tolerance and the expected evolution of the LED given by their technical specification these were the expected values to be obtained. 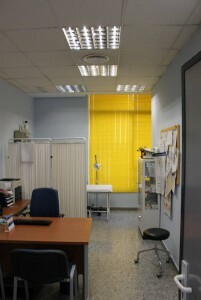 The subjective satisfaction of the medical, technical and administrative staff required is in all the cases positive. The table 2 shows the values required by the normative to be found on this type of public service. Figure 5: Outdoors of the C.E.S. Portada Alta. Table 2. 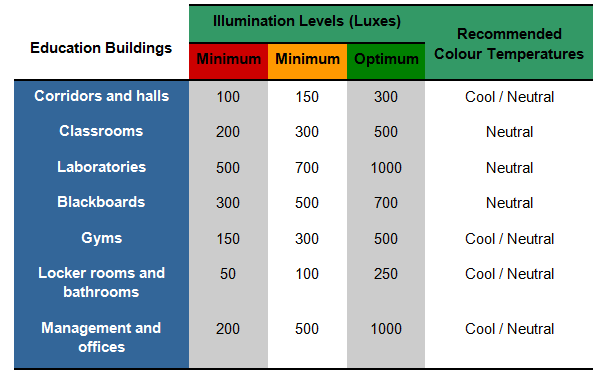 Illumination levels and color temperature requirements for education centers. 960 fluorescent tubes of 36 W nominal power (not including the ballasts). 40 units of fluorescent tube fixtures with one magnetic ballast (in a deteriorated state or obsolete). There have been made real consumption measurements in almost all the classrooms and the offices of the institute before and after the change. The real power consumed by the fluorescent tubes was a value measured between 45 W and 65W depending on the type and brand of the tubes and the state of the electromagnetic ballast installed. The average consumption of the 960 tubes results of about 54 W per tube (all together with their auxiliary components working). In classrooms with some non-operating lamps: Less than 140 lux. 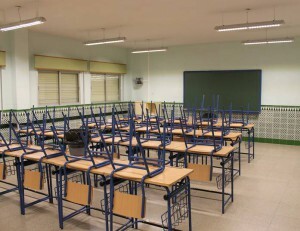 In a classroom were all the tubes were placed, with the average wear of time they have been used: 240 lux. Neither case reached the average levels of brightness legislation called by the legislation: at least 300 lux required over the student tables. There were in many cases fluorescents tubes not activated or not placed on the luminaries. In some cases there were found properly working barely a 50% of the total of lamps. The magnetic ballasts were in a bad conservation status. 960 LED tubes rated at an average power of 20 W.
460 luminaires for 2 LED tubes. 40 luminaires for 1 LED tube. In this case, the luminaries were old and damaged so that it was decided to replace all of them while keeping the electrical installation with the same number and position of luminaries as explained at the beginning of this changing process. 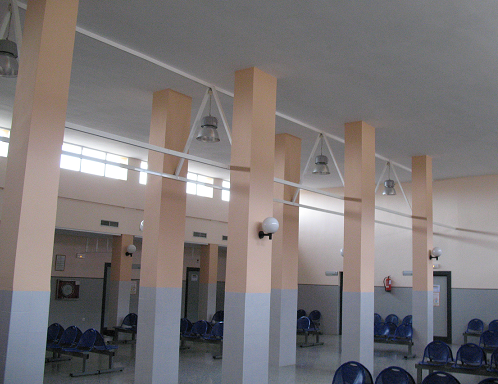 Figure 6: Examples of the LED lams system obtained after the lighting renovations renovation of the C.E.S. Portada Alta. The tubes designed with 24 LEDs CREE MX-6® were consuming, depending on the configuration of the power supply, from 16 W to 22 W. By regulating the voltage supply levels we obtained for each case the required 300 lux with an average consumption of the tubes of 20 W.
All these means that the actual energy savings being achieved at the education center, referred to the lighting installation, is a 63%, since the number of fluorescent tubes that were working was only 60% of the number of LEDs tubes that are running after the change. 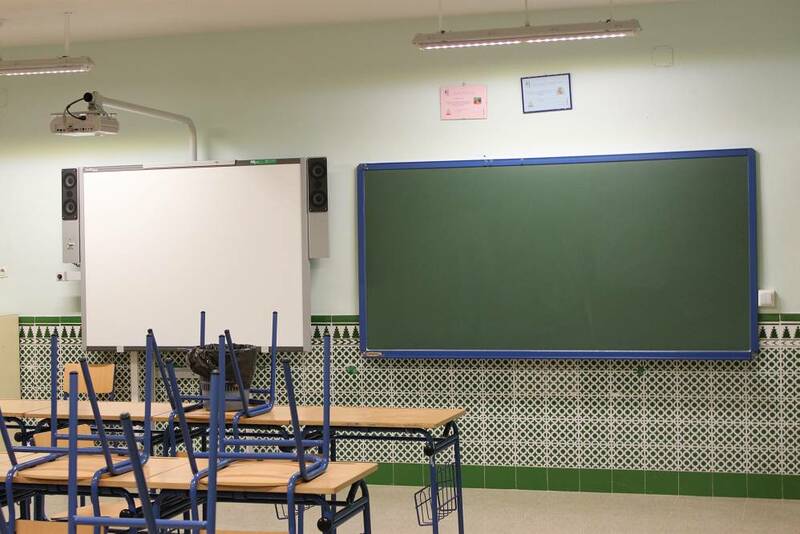 The measures of the various departments of the educative center did not only meet the current legislation (300 and 500 lux) but can be potentially overcome by regulating the voltage of the power supplies in case it is approved a new regulation requirements with higher levels of brightness. 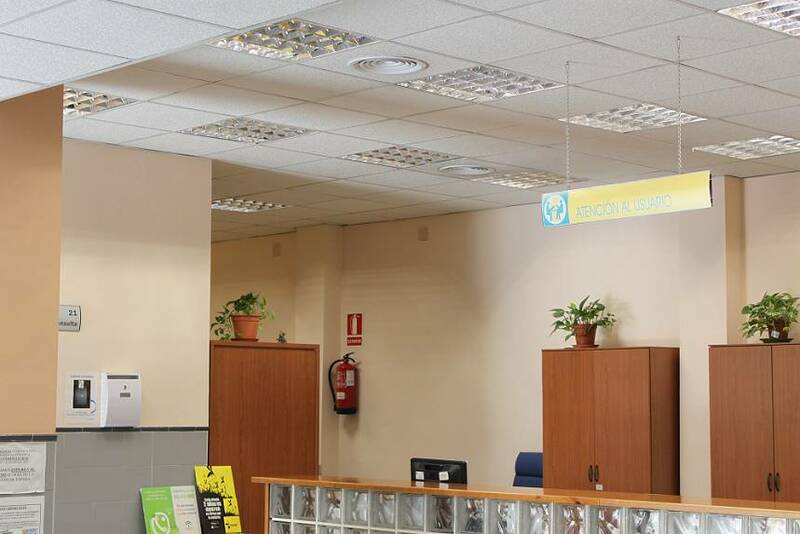 The installation was regulated with a 5% of margin over the values required to compensate the light depreciation caused by the lamps degradations with time of use over the years. 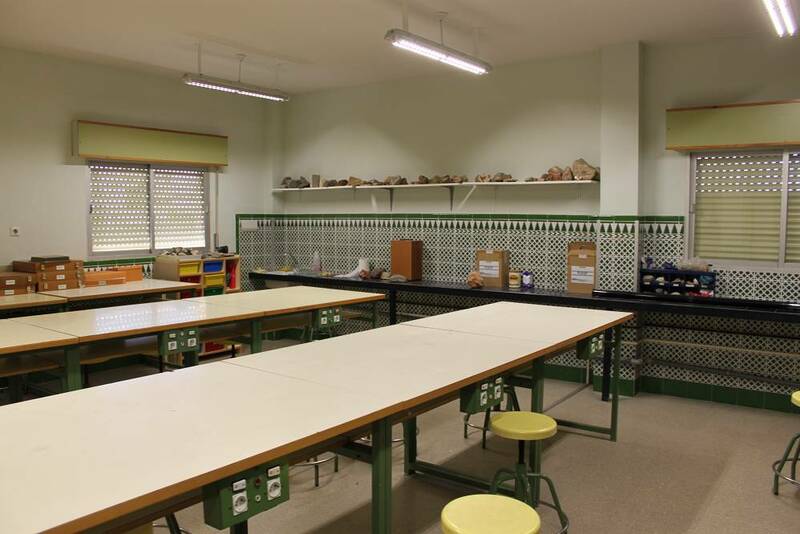 In the case of the three school´s laboratories there have been placed tubes 32 LEDs CREE MX-6® (27 W). With them the average levels measured on these rooms exceed the 500 lux on the working plane (away from the precious 240 lux that they had with the fluorescent tubes). This change does not mean a significant increase in the consumption per tube. It has been achieved with the change in the lighting installation the brightness levels that meet the current regulations and that means more than double the levels given by the fluorescent tubes. The actual power consumption of the lighting has been reduced by a 34%. The analyzed and calculated average daily use of tubes for this installation is of 9 hours per day, 265 days each year. The energy saving achieved is 34 W x 9 h x 960 units x 265 days = 77,846.4 kWh. Estimating an average cost of 0.16 euros/kWh, the savings obtained with this energy efficient installation is estimated in 12,455 € per year. If we add about 7,500 € savings per year in maintenance costs of the 960 tubes, we will have an annual saving of 20,000 €, complying with current legislation against the clear breach found on the previous situation. The payback period of the system with energy saving has been estimated at a little less than four years. This period can be even shorter if we consider the incentives of the European directive in force to promote energy saving. Figure 7: Visual comparison between the fluorescent (left) and the LED (right) installations in the C.E.S. Portada Alta. In this period of use there had been reported two malfunction incidents of the lighting installation, both of them were informed between the first month of use. They have been causes by two power supplies that had to be changed and by three luminaries that were no properly finished in the installation process and their trims had to be placed again. This means that the maintenance cost of the lighting installation during this first year can be consider null. After solving these aspects all the lighting points are working properly and with the expected values of illumination measured. The average reduction of the illumination measured after this period compared with the values obtained in the same points are found to be in the range of 0% and 3%. In this sense, all the values taken are still over the normative requirements. If we consider a minimum measure tolerance and the expected evolution of the LED given by their technical specification these were the expected values to be obtained. The subjective satisfaction of the teachers, technical and administrative staff required are, in all the cases, positive. The number of LED lighting installations worldwide is increasing exponentially in these last six years. The results obtained in functionality, energy efficiency and reliability are being found higher than those obtained by conventional technologies, even the latest ones. In Spain, several private and public initiatives are also using this new technology in new architectural projects and, as in the cases shown in this work, in the renewing of old lighting infrastructures. The results obtained with the analysis and renewal of two public buildings for educational and health assistance porpoises have shown that the investment on this type of energy efficiency projects lead to a short-term economic payback by lower consumption and maintenance costs. Also as a main result obtained with this kind of initiatives in that the installations prepared by public general concurrence must be reviewed and prepared to meet all the requirements necessary by the safety and comfort of use of these installations. Thus, reviewing and preparing the buildings to accomplish in a long-term basis with all these normative and even to be reconfigured to increase the illumination level in case that the requirements will get increased will help to save more many in the future. How conventional lighting systems have evolved over the years in these types of public buildings. How much money can be saved using new energy efficiency equipments. 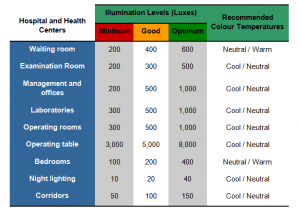 How much cost is reduced with low maintenance lighting systems. How much can be improved the luminance levels. The real evolution of this type of long-lasting LED equipments. 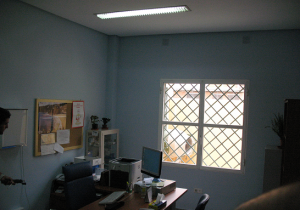 AAE (Agencia Andaluza de la Energía), 2007. “Plan Andaluz de sostenibilidad Energética”, Editor: Agencia Andaluza de la Energía. Approved by the Government of Andalusia on 13, November 2007. 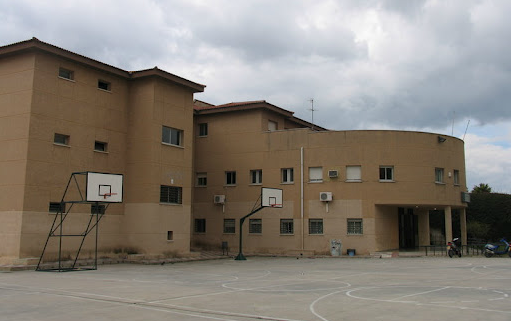 BOJA (Boletín Oficial de la Junta de Andalucía) 2003, ‘Norma de diseño constructivo para los edificios de uso docente’. Orden de 24 de enero de 2003 de la Consejería de Educación y Ciencia’. BOJA Nº 43 de 05/03/2003. IDAE (Instituto para la Diversificación y Ahorro de la Energía), 2007. Plan de Acción 2008 – 2012. Julio 2007. SAS (Servicio Andaluz de Salud) 2008, ‘Guía de diseño de Centros de Atención Primaria’. 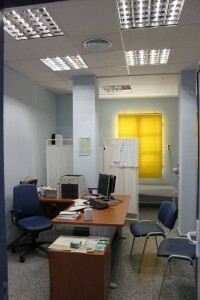 Servicio Andaluz de Salud, 2008. ISBN: 978-84-691-8441-7. D.L. : SE-3480-2009. 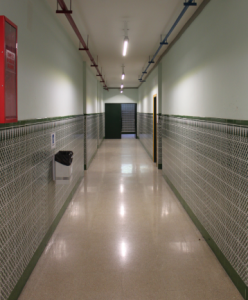 Dentro del “Plan Andaluz de Sostenibilidad Energética“ se propuso, bajo concurso publico, la remodelación de la instalación de iluminación de dos edificios públicos: un centro de salud y un instituto o centro educativo de secundaria. Este proyecto busca, a través del uso de la tecnología LED, desarrollar dos pilotos en los que poder obtener, para este tipo de edificios, no solamente una infraestructura energéticamente eficiente sino que esta cumpla con la normativa vigente, que sea confortable para los usuarios del centro y que posea un coste de mantenimiento muy reducido. De este modo, se debía analizar la instalación conforme a todas las especificaciones técnicas generales, a nivel europeo y español, y las especificas para la función de uso de estos edificios. Análisis y estudio del estado y los niveles de eficiencia de las instalaciones existentes antes del proceso de remodelación. La instalación y el análisis de los parámetros técnicos de las nuevas instalaciones LED tras la remodelación. La revisión y análisis del comportamiento de la instalación tras un año de funcionamiento. En este trabajo recogemos los resultados más importantes obtenidos en cada una de estas tres etapas, comparando las dos instalaciones, la antigua convencional y la nueva basada en LEDs. Mostramos los principales valores técnicos obtenidos y analizamos aspectos económicos relacionados con estos procesos de remodelación.